Sailor Moon is back with a vengeance- this is why she should never have left. Sailor Moon is on Hulu, uncensored and subtitled. I’m thrilled because I’m a huge fan, my nickname is Bunny BECAUSE of Sailor Moon. I had already been a huge comic book nerd before being introduced to anime. Because I’m sure you want to know, I was a total DC over Marvel girl, with exceptions for X-Men and Spiderman. Batman was my main game, and I spent hours scouring flea markets for back issues. It was my main activity in life for most of my childhood. I’m half-Canadian and spent most of my summers in Canada with my mom’s side of the family. One summer between elementary and middle school, I saw Sailor Moon for the first time in my grandparents apartment. I’m pretty sure my cousins thought I had turned into a huge dork (I had managed to keep my dorkiness under wraps until this point), but I didn’t care. I was totally entranced with Sailor Moon. I was Sailor Moon for Halloween when I was 13. I also maintained a Geocities webpage dedicated to Sailor Moon at that time. Despite all this, I was still seen as somewhat of a “weirdo” at school. Kids, amirite? Sailor Moon is the creation of Naoko Takeuchi. In 1992 Japan, Nakayoshi Magazine began publishing her manga (Japanese comic books) about Usagi Tsukino, a 14-year old clumsy, binge-eating, crybaby with bad grades who also happens to be an intergalactic superhero. Later that same year it began its adapted anime version, a dub of which made it’s way to the US/Canada in 1995, only to be kicked off the air before airing all seasons. It was a sad time involving message boards, petitions and rudimentary crowdfunding attempts to make a fan-created dub. It was that serious. And we didn’t have the fancy social medias or kickstarters of todays internet! No, this was back in the wild west of the web: ICQ and alt. message groups. Well, the dreams of my middle-school self have finally come true. Not only is Hulu featuring the original anime series uncensored and subtitled, but also, in July, a revamp called Sailor Moon Crystal more closely based on the manga will be simulcast. Kodansha has been publishing the manga in English in proper form for the past two years. Yes, I’ve been collecting them. I introduced them to the 4th grader I used to babysit, now its a legacy. Usagi is Sailor Moon. She is delightfully imperfect, and downright irritating at times. She’s not a bad person, but she’s far from aspirational. She’s prone to rages and histrionic rants over silly teenage girl things. She’s way more concerned about video games and manga than she is about her schoolwork. She’s a very reluctant superhero, even cowardly at times. Superheroes are often too perfect. Superman is literally a nearly impervious alien who grew up with small-town values. Bruce Wayne is a billionaire, but has a tragic past and values justice above all else. Peter Parker is a regular kid from Queens, but he’s extremely smart and the perfect underdog. I often find we make our female heroes even more perfect (Wonder Woman whom I LOVE but, c’mon, not relatable) or just lightly feminized versions of male characters. Even in a non-comics context, romantic comedy female leads most common problem seems to be that they work too hard and are too successful. In other words, most female characters historically are not even based on real humans and rarely get to have the fun. I demand more lady lovable rogues! The landscape in comics has changed thanks to amazing writers like Gail Simone, but in the 90s the dynamic was still very much a boy’s club. I loved Catwoman, Batgirl, Storm, Rogue, et al but they were all still very much idealized archetypes of women drawn with the male gaze in mind. It was refreshing to see not only a female superhero, but an unabashedly girly one created by a woman. And it didn’t take itself too seriously, the anime especially had a tone of campy comedy interspersed with action. The early seasons don’t shy away from the trivial thoughts that occupy the minds of typical teens. And our Sailor Scouts are no different. Really there wasn’t just one superhero, there were as many as there are planets! My friends who didn’t like how Sailor Moon could be “dumb”, enjoyed Sailor Mars fierce self-serious nature or Mercury’s genius IQ. Sailor Moon also featured gay and lesbian relationships and non-normative genders. There was no “very special episode” concerning it, it was just a part of the world. Not that the American kids got to see that, in the US dub they made Sailor Neptune and Sailor Uranus creepily close cousins and didn’t even get to the gender-bending Starlights. The only thing left to happen is for there to be an American attempt at a live-action Sailor Moon movie. I’m thinking something really stylized that’s a bit tongue-in-cheek. Of course we should use an unknown to play Sailor Moon (me? I can pass for 15…), but the really cool part is that any Sailor Moon movie will pass the Bechdel test with flying colors. 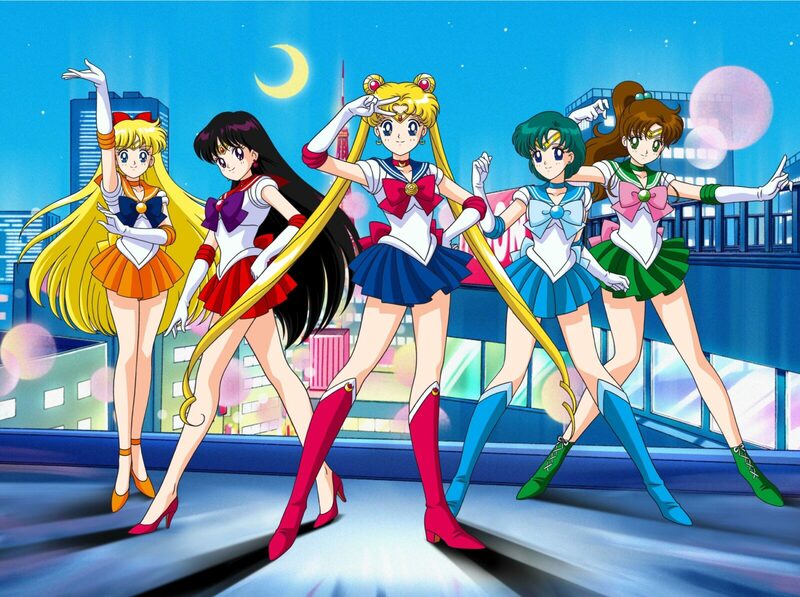 Hulu is releasing two more episodes of Sailor Moon every Monday, and Sailor Moon Crystal will start July 5.